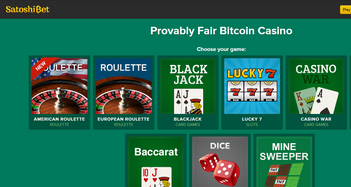 NOTE: Satoshibet is now closed, so please try our top recommended casino for the best Bitcoin bonuses. SatoshiBet is named after the founder of Bitcoin Satoshi Nakamoto. This casino is unique in that they accept Litecoin and Dogecoin as well as Bitcoin. The selection of games is very limited, and the titles that can be found are functional at best. On the positive side, all games are provably fair, and you can play completely anonymously if you wish – without even needing to register an e-mail address. This review gives you a complete overview of SatoshiBet casino. First up, the financial side is covered. This includes incentives (or rather the lack of them) and how to deposit and play with your Bitcoin. Next the games are reviewed. There are only 9 of these, which has enabled me to describe each one individually. At the end of this page you will find information on the trust signals at SatoshiBet, along with my final thoughts on how this casino compares with the BTC gambling alternatives. The bonus section will be short for this casino. There are no bonuses, no promotions and no loyalty benefits. 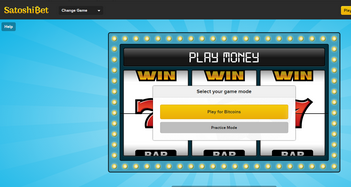 This casino is a lightweight, what-you-see-is-what-you-get way to gamble with Bitcoins, and not overtly commercial. This does have the advantage of simplifying the terms and conditions, with no need for play-through requirements or weightings for different games. SatoshiBet have an entry in their terms which specifies they can close dormant accounts after 6 months. This was challenged in their BitCoinTalk thread. The support rep assured players that this was just to allow them to clean their database and not intended as a way of taking BTC from accounts. While there is no reason to dispute this, the potentially tricky term is still in place. 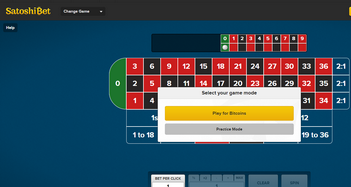 A unique feature of this Bitcoin casino is that you do not need an e-mail address to be able to register. Instead you can use a unique URL which is issued at registration. The idea is that you save this in your bookmarks and access the site this way. There is the option to register with an e-mail address, which does provide you a way of verifying your ownership of the account in the case that you lose your access. There is no verification step required, and SatoshiBet even comes up with a user name for you (this can be changed). After you complete registration you click the yellow ‘Deposit Bitcoin’ button at the top of the screen. This brings up a new box with a ‘generate address’ button. You’ll get the recipient Id to copy and a further button which gives you the QR code after this. Depositing will be pretty much instant, with the coins available to hit the tables with immediately. I was not able to find a minimum deposit amount, however withdrawals are available from 0.1 mBIT. Whichever way you look at it, the games here suffer from 2 issues. Firstly there are only 9 of them in total. Second, the games themselves are extremely basic – looking like something the first home computers of the 1980’s could have generated. There are two plusses to balance this. The games are entertaining, in a retro and quirky way – and they are all provably fair. This means that the strings of characters which generate the deal and the ‘cut’ of the deck can be combined and verified after each game – showing you that the deal was truly random. American Roulette: This ugly number does not have an actual wheel on display, just a strip of numbers at the top of the screen in the same order as the slots on a wheel. You click to bet, with corner and split bets possible in addition to numbers, and the outside bets. 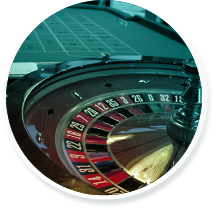 This wheel contains two zero slots, and should be avoided in place of the next game – European Roulette – since this makes the house edge considerably higher. European Roulette: This is the same game as the American Roulette, with just the single green zero. Blackjack: With an expected player return of 99.63% this is an extremely low edge game. Most of the money made will be due to player mistakes against the best strategy. The game is US rules, which means there is a ‘peek’ for Blackjack if the dealer shows an ace or ten. The game is slow and plain looking – though perfectly playable. Video Poker: This game is Jacks or Better, with the smallest pay-out being for 2 Jacks. You’ll find a very simple layout, with the pay-outs clearly on show along the top. It is not clear that you click on the cards themselves to hold them after the initial deal. A small house edge game when played correctly. Lucky 7’s: This is a traditional 3 reel slot game, which does include a jackpot pay-out (currently 367 mBTC). The return to player is 99.6%, which is excellent for a slot. You can win 500x your spin from the normal pay-outs, and scoop the jackpot too. This is one of only a small number of provably fair slots online. War: This simple card game sees the highest card win – and only gets interesting if you tie with the dealer for the initial card. When this happens you can surrender, or go to war – with the option to win much more. Baccarat: Another simple rendition of a classic casino game. Here you bet on Player, Banker or Tie and the computer handles the complex 3rd card drawing rules. I advise against the tie bet, which has a house edge of almost 15%. Dice: I am not sure that ‘Dice’ is quite the right name for this game, which could be changed to ‘guess the randomly generated number’. You choose whether the outcome will be higher or lower than 50 by default, or adjust the percentages to suit your risk tolerance. This is a popular game which many players use to test betting systems and strategies. Minesweeper: Pick a square and hope that you do not land on TNT, in this strange game you make your way across a grid of different proportions. If you miss the explosion, then you get a footprint. Pay-outs based on how much risk you take (minus a small house edge). These games have a certain charm; however they are hardly the kind of titles which will see people coming back to SatoshiBet for more very often. This casino was one of the first to offer BTC gambling, opening their doors in the spring of 2013. There are no major scandals or issues either in the Bitcoin community or elsewhere. The biggest trust factor of all – an operating license – is not in place at this casino. While this is not necessary in the anonymous world of Bitcoin gambling, it does take away the only avenue of redress should there be a significant dispute. In other words, you have no licensing authority to turn to should your BTC disappear. Ownership is also opaque, with only an e-mail address to contact the casino. Balancing this is the use of provably fair technology in every game you play. While using this is not necessary, the games have been checked by players knowledgeable about these matters, and no issues have arisen from this. Combined with the low house edge in the games, including the server and client strings is an excellent sign. I see no reason to believe that SatoshiBet is rouge in any way, and they have no pay out issues so far. With Litecoin and Dogecoin support, and completely anonymous play with BTC, this casino has positioned themselves uniquely in the cryptocurrency casino world. The area that really does need working on is the games. After you get over the novelty of the retro feeling, these leave a lot to be desired. Overall I’d give SatoshiBet a B rating. If they can add some bonuses or promotions, they would definitely be a B+ or even an A.